Pin setting is speeded by a new electric machine that completes the operation without supervision. 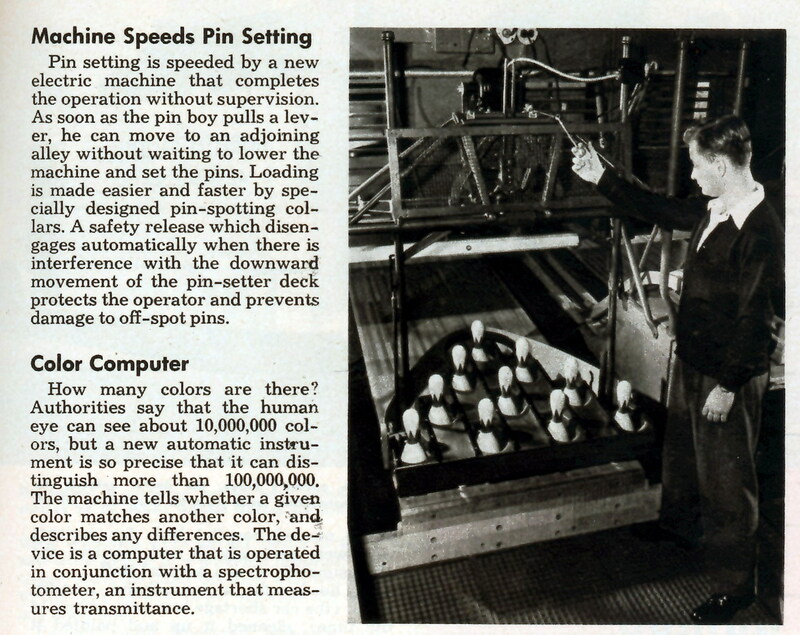 As soon as the pin boy pulls a lever, he can moce to an adjoining alley without waiting to lower the machine and set the pins. Loading is made easier and faster by specially designed pin-spotting collars. A safty release which disengages automatically when there is interference with the downward movement of the pin-setter deck protects the operator and prevents damage to off-spot pins. Aspirin mask acne. Aspirin packaging cost. Aspirin dosage for dogs. Aspirin sensitivity tylenol. Giving dogs aspirin….